The first of three workshops in a new research project which is led by SPERI research fellow Scott Lavery took place on Tuesday 14th June 2016. The research project is funded by the White Rose Consortium and examines the political economy of Britain’s changing relationship with the EU in general as well as assessing the implications of a possible ‘Brexit’ more specifically. 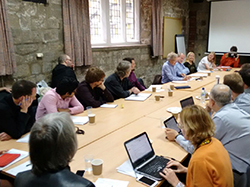 The first workshop of the series – which was organised by Professor Lucia Quaglia at the University of York – was entitled ‘Britain and Europe: The Political Economy of ‘Brexit’ in Trade and Finance’. The first panel covered a range of topics related to the issue of trade. Panellists reflected on the different trade discourses utilised by those advocating a ‘Brexit’, the implications which a ‘Leave’ vote might have for Britain’s record current account deficit and the prospects for expanding trade with Africa in a post-Brexit environment. The second panel focussed on the issue of finance, the EU and a possible Brexit. Panellists reflected on the relationship between the British government’s preferences and financial regulation policy at the EU level, the implications of the Eurozone’s banking union and capital market union for Britain’s relationship with the EU and the link between private equity and the politics of the EU referendum. Andrew Gamble – professorial fellow at SPERI – delivered a keynote speech outlining the possible implications which a ‘Brexit’ might have for internal Conservative party politics and for economic policy more generally. The next workshop will take place on 16th September 2016 at the University of Sheffield and will focus on labour market and welfare policy in a context of ongoing economic imbalance within the EU. Details of the next workshop will be released once the EU referendum has taken place on 23rd June. For further enquiries about the project, contact scott.lavery@sheffield.ac.uk.